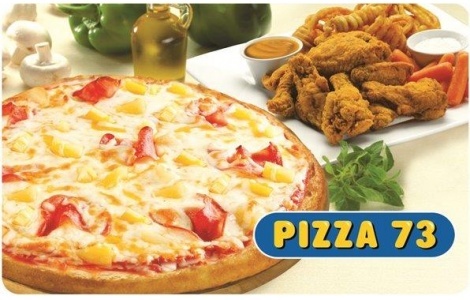 Pizza 73 offers a delicious and diverse menu – from wings to pasta to fries... and of course pizza! Perfect for all tastes and a great gift for any occasion. Founded in 1985, Pizza 73 has over 80 locations across Western Canada, each delivering on a promise to serve a “better meal, better deal” everytime by focusing on quality ingredients, customer service, community contribution and continual innovation. Pick up Pizza 73 gift cards at participating Pizza 73 restaurants and load it with $10, $25, $50 or $100. You can use Pizza 73 gift cards yourself, turn it over to a family member or give it as a gift to friends and acquaintances. The Pizza 73 gift card is a convenient way to indulge in the pizza experience. Order your Pizza 73 gift cards from National Gift Card Canada today! This card is redeemable for merchandise at participating Pizza Pizza and Pizza 73 restaurants and may not be redeemed for cash, except as required by law. Protect your card against theft, loss or damage by registering it at www.pizzapizza.ca or www.pizza73.com. We will replace the balance remaining on registered cards at the time we are notified of the loss. Reload (up to $200) at participating Pizza Pizza and Pizza 73 restaurants or online. Check registered card balance at participating Pizza Pizza and Pizza 73 restaurants, online or call 1.866.368.2111. This card is the property of Pizza Pizza Limited. We reserve the right to correct the balance of this card if a clerical, billing or accounting error has occurred and shall have no liability for any billing error unless you notify us within 60 days of the transaction date. This card will not be accepted if it has been obtained by fraud or theft and we reserve the right to cancel such cards. For complete terms, conditions and benefits, please visit our website. Use of this card constitutes acceptance of the complete terms and conditions.